As I write to you this Wednesday morning, the Queen Emma Square is affected by very sad news last week. 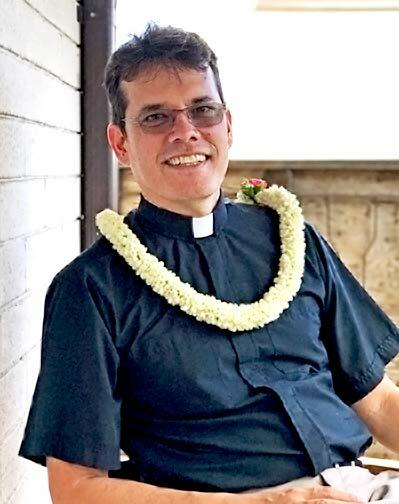 We learned that the young boy who died in the kayak accident in Kaaawa was a kindergarten student at St. Andrew’s Prep, the boys’ program at St. Andrew’s Schools. This is, of course, devastating news not only to the school but also to the family of the boy and I ask you to please set aside time in your day today to say a special prayer for the repose of his soul and for his family and the faculty and staff of the school. Please remember to wear your name tags on Sunday morning, especially to the aloha hour. I will commit to wearing mine and a number of folks have already contacted Ramona to request name tags. I’d like to make this part of our hospitality here at the Cathedral and I thank you for your willingness to take part. 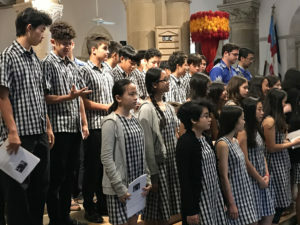 We had a wonderful treat on Sunday morning at 8:00 service when students from John Alexander‘s class at Iolani School came to sing the anthem for us. I’m very grateful to John and Todd for making this happen and that ends well as for the beautiful music that the young voices offered. I wasn’t able to get the entire add them on video, but I did manage to take a short snippet which I will attach here. Please remember that we have a workday scheduled for Saturday, April 13 beginning at 10:00 AM and culminating with a Eucharist in the Cathedral sanctuary at 5:30 PM. There are a number of projects that we have planned and I look forward to being there and working with those of you who can come to lend a hand. St. Andrew’s Schools will be holding their annual Queen Emma Ball on Queen Emma Square this Thursday evening and the Cathedral will make Davies Hall, the sanctuary, and our parking lot available to them for this event as the school is part of the diocesan family and integral to the life of Queen Emma Square. I will be attending the event that evening and I am sending best wishes to the school for a successful and productive fundraising endeavor. The Cathedral’s Worship Committee will be meeting this week Saturday, April 6 at 9:30 AM to make plans for our Holy Week offerings. Please remember that we have a full schedule of worship beginning with Palm Sunday and ending with Easter Sunday. Worship times and dates are available here. Please remember that we will have Evensong at 5:30 PM on Sunday, April 7 in the Cathedral sanctuary. I will be officiating the service that evening and hope that you will be able to attend. I know that the music will be beautiful and the prayers will be fervent. On Sunday, June 2 at 5:30 PM we will hold a special Evensong to honor Uncle Hartwell Lee Loy. I hope that those of you who know Uncle Hartwell will make plans to attend. I got a report that last Sunday after the 8:00 AM service there was an altercation between two people in the Von Holt Room during the aloha hour. At the staff meeting today I addressed this issue and have asked that the security guards pay special attention to what’s going on during our aloha hour. Having said that, I commend those of you who were there for calling the security guard immediately and seeking assistance. This was absolutely the right thing to do. Finally, Todd has made arrangements for the choir from Hawaii Pacific University to join us on Sunday morning at the 10:30 service and I know that they are sure to offer wonderful music to enhance our worship that morning. It has been another full week at the Cathedral and we are still riding on the wave of excitement from hosting the presiding Bishop. The staff and I are looking toward Holy Week and Easter and doing all we can to help everyone enter into a full and meaningful worship experience. Until we see each other at worship this weekend, please take care.